I was delighted to listen to "The Great American Midrange" yesterday and realize not once had I been compelled to skip a track or two - how long has it been since *you* had an album worth listening to straight through? The songs are each carefully constructed, passionate, and easy to get immersed into. There's a lot of variety from track to track and even within a song, while not sacrificing a coherent narrative. A Midwesterner like me hears the themes of local life as I know it and that authenticity is moving. The lyrics are poetic and clever. The songs range from the powerful ("Thunderhead" and "Strut"), the race-worthy "Back to Indiana" and the soul baring "The Little Ways." The coming-of-age story behind "Unless God Appears First," addresses regret and repentance in the tradition of the blues but with a modern, neo-apathetic twist. An untitled bonus track is a sweet and savory ending to the album. 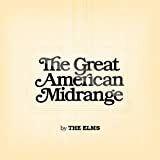 I'm reading: The Elms Great American Midrange is a genuine 100% listenable albumTweet this!